Have you ever experienced the fine spray from misting fans while walking around a theme park or dining al fresco at a high-end restaurant? Did you wonder how you could replicate it in your own backyard? On a really warm day, a regular fan just doesn’t cut it, you end up merely blowing hot air around. Misting fans reduce the temperature, making the heat more manageable for you, your guests, or even your pets. In this article, we’ll share with you what a misting fan is and how it can benefit your personal outdoor space. We discuss how it cools the air around you and how effectively it works at making summer nights, and days, more comfortable. There are different types, so we’ll look at how they compare, to help you decide which might be the best outdoor misting fan for you. Finally, we will give you detailed reviews of what we think are the top models currently available on the market today. What is a Misting Fan? How Effective are They at Cooling? What Type of Misting Fan Solutions are There? Power Supply – Mains or Battery? A misting fan uses airflow from a fan to distribute tiny water droplets through the air. It uses either a water reservoir within itself, or your regular garden hose. They are designed to be flexible, with height adjustments, oscillation, different fan speeds, and water pressure adjustments. You can decide just how much misting you need and exactly where you want it. They bring the benefits of air-conditioning to the outdoor areas of your home. These fans work by cooling through evaporation. Basically, when it’s hot, the fine spray of water evaporates, drawing in the heat with it. The cooling effect occurs as the mist evaporates off your skin. It also cools the air around you as it dries up from hot surfaces. This method of cooling can lower the air temperature by anything from 15 to 40 degrees Fahrenheit. This can make hot summer days and nights sitting on your deck much more comfortable. Add to that the airflow provided by your fan and you’re onto a winner. The higher the air speed, the greater the area covered and the greater cooling effect. Have you ever noticed how cooling even the slightest breeze can be? This is because it blows away the evaporating moisture that sits on your skin. The more airflow there is, the faster the moisture can be dispersed. As a result, a misting fan is effective at cooling both your body and your surroundings. Floor standing fans: These have a base, an extending pole and the fan attached on the top. They can easily be moved around wherever you need them. When used outdoors, they have a hose connection for water supply, and plug into an electrical outlet for power. Most can be adjusted for height and include an oscillation function. Wall mounted fans: This specialist style is fixed to a wall or ceiling and, again, connect to a power outlet and water supply. They can be tilted to provide a misting spray at the angle required. 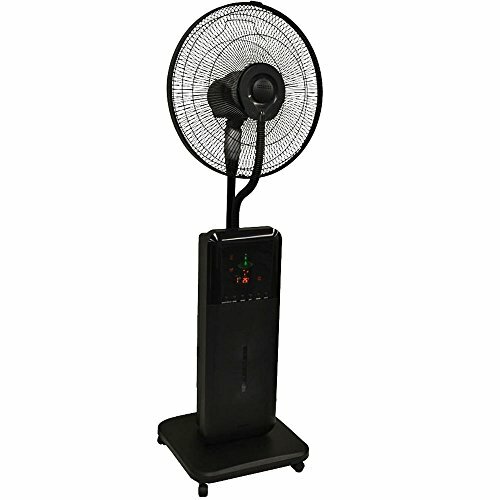 Compact or Portable Fans: Generally much smaller than a floor standing model, these misters take up less floor space. Their power supply could be from electricity, or batteries in some models. Water supply may be from a garden hose, an internal water tank or an external container. 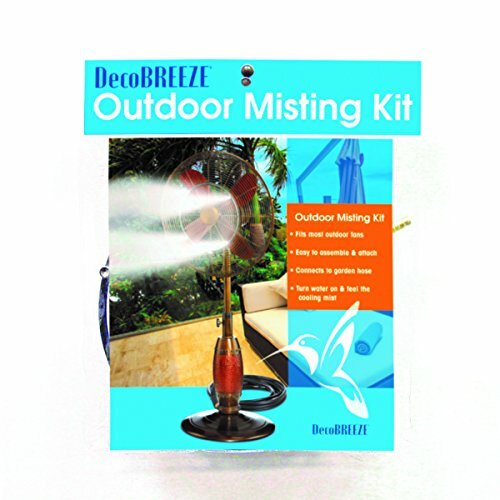 Misting Kits: These kits convert your regular fan by attaching hoses and nozzles to provide a misting function. They include all you need to easily assemble, and give you the cooling power of water alongside the airflow of your fan. There are several things to evaluate before choosing a misting fan. Let’s look at some of the aspects you need to consider. Think about where you’ll be using your fan. Some are suitable for misting either indoors or out, but not both. Others can be used both indoors AND outdoors, but if used inside the home the misting function should be disabled. If you’re going to be using it exclusively outside, then it’s important to look at the materials it’s made from. You’ll want it to be weatherproof, rustproof and to have a motor and switches that are protected from the elements. It’s also a good idea to make sure the power source is protected. Both floor standing and portable fans are versatile when it comes to positioning. Consider how much space you have for your fan and where you want the effects of the misting function. A floor standing model might take up more space but will likely disperse air and mist further and more efficiently. Portable models are generally easier to relocate, although still restrained by the need for power and water supply. Battery-operated models are the most versatile for remote locations, although possibly not as effective as their mains powered counterparts. Again, this could be a matter of where you intend to use your fan. For mains power, you need to ensure you have a cord long enough to reach a plug socket, or invest in an extension lead. A battery-powered unti can be used anywhere you want; all you will need is water and a charged battery. It’s a good option for tailgating, camping, days at the beach, or at the bottom of the garden where there isn’t a power source. Fans come with different blade sizes, varying speeds, and multiple oscillation functions. The higher the fan speed and size of the blades, the larger the area it will cover. 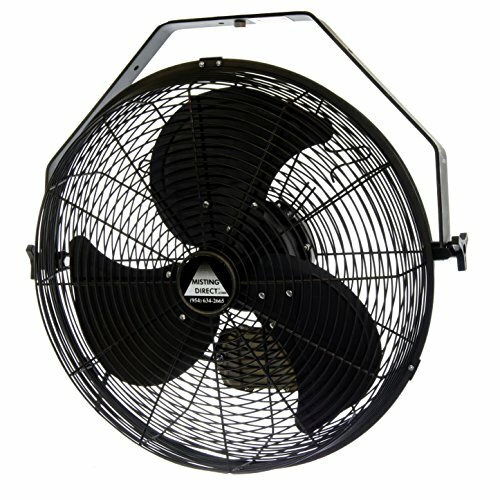 If you have a small deck and just want to cool the immediate area for a few people, then a compact fan could be enough. A larger patio space will require a model with a far higher speed and good area output. The speed of the fan is measured in cubic feet per minute (CFM). The higher the CFM, the more airflow you will experience and the larger the area that can be cooled. Some can cover areas up to as much as 1000 square feet. Fans come in different shapes, sizes, and colors. Think about whether the style will fit in with the design of your patio. You don’t want it sticking out like a sore thumb, even if it does keep you cool. The easier a misting fan is to use, the more likely you are to utilize it to its full capacity. Having the right connections for water and power in place will help. Many fans are easy and quick to assemble, meaning you will be cooling down in no time at all. The same goes for conversion kits; they generally come with everything you need to convert your normal fan into a misting model quickly. Budget is always something to be considered when buying a new appliance. Prices can vary, but inevitably you get what you pay for. Buying cheap can often be false economy as it might not last as long. If you already own a fan, then a conversion kit is likely to be your cheapest option. If you don’t, then buy the best outdoor misting fan you can afford. Now you know what they offer and what to look for, these are what we recommend and consider as the best models available on the market today. One of the advantages of a pedestal or floor standing fan is the ability to move it wherever you want. Here are our top picks of the best on the market. Hot, dry, summer nights sitting out on the deck can leave you wishing you had a pool to dive into. If there’s not a hint of a breeze, but it’s too nice to be sitting indoors, then the Windchaser outdoor misting fan can help reduce the ambient temperature, making your evening more comfortable. Windchaser takes fans to another level with it’s misting option. It provides a fine mist to cool both you and the air around you. Easy to operate and UL listed, for both outdoor use with the mister, or indoors without. The water supply comes from connecting to a standard ¾-inch garden hose. This means you don’t have to keep filling up a water reservoir, it’s literally on tap. The spray is angled into the airflow by four nozzles, so it covers the maximum area possible. Regarding area, it can cover up to 640 square feet with its aerodynamic 16-inch blades. It’s powered by a shower proof motor, has three speed settings, and also oscillates. The covered switches make changing speeds a breeze. Leaving the fan outside poses no problem, as it’s both UV and rust resistant. However, if you do want to move it indoors, simply disconnect the hose. The base of the fan measures 20 inches diameter, and you can adjust the height from 47 inches to 58 inches. A three-prong power cord connects to an electric outlet. The fan is supplied with six feet of hose and four replacement misting nozzles. This is a great accessory if you don’t have a spare garden hose to supply water. Height adjusts between 47 inches and 58 inches. Standard ¾-inch hose connection for water supply. Can reduce the temperature by up to 25 degrees. You will get wet if you sit too close. Misting nozzles need regular cleaning to ensure they don’t become blocked. The Windchaser fan can make those hot steamy summer nights a lot cooler. It’s easy to assemble and operate. Just remember to keep your distance, unless you want to get wet. Click on the link to check out more info and the latest price. Imagine an all-in-one entertainment system, air purifier, air cooler, and mosquito repellent. It might sound too good to be true, yet the CoolZone fan offers all these benefits and more. This misting fan is suitable for use both indoors and outside. The ultra-fine water particles dispel into the air and cool it down without getting everything wet. This is a good option for the heat of summer indoors when you don’t want to use, or don’t have, air conditioning. Water is supplied to the fan from a reservoir within the base. Polar ice packs are also included if you want to be kept ultra cool. Just freeze them, then pop them inside the tank for even more relief from the heat. As well as hydrating the air around you, the fan also has an ionizer. This releases negative ions into the air, helping to purify it. When using the fan indoors, it has thermal sensors which detect and display the temperature, so you know how hot it really is. Continuing with the multi-function capability, it also includes two inserts to repel mosquitoes. This is ideal for keeping those irritating bugs away when you want to enjoy time outdoors. The fan has four wheels on the bottom, making it easy to move around the home, or out onto the deck. You can even operate it by remote control. Finally, Bluetooth technology is built in, along with speakers, allowing you to play music from your cell phone, tablet or PC – perfect for parties. All this comes with a one-year manufacturer’s limited warranty. Measures 51.5 inches high, 14.75-inches wide and 18 inches deep. Quiet in operation, on all speed settings. Good sound from the Bluetooth speakers. The misting area could be larger. Offering many benefits beyond a misting fan, if you’re into gadgets, this could suit you. An added mosquito repellent is a bonus as is an ionizer for fresher air. You can also listen to music wherever you go. What’s not to like about this fan? Check out the latest price by clicking the link. If you think fans can be an eyesore, we might be able to change your mind with this offering from Dynamic Collections. It has a catchy retro look, finished in a bronze color, with a rope feature just above the base. This fan is both versatile and stylish, plus it’s suitable for use indoors without the misting function. However, it’s really made with outdoors in mind with the bronze paint being both UV resistant and weatherproof. A misting kit is included, which utilizes your existing water supply and hose. It’s easy to attach and will keep you cool on hot sultry evenings. The height can also be adjusted to exactly where you need it, and the fan also oscillates—ensuring you get the best coverage possible. Whether you want a gentle breeze or something a little stronger, there are three speeds to choose from. Spread the coolness by cranking it up to the max at 1280 rpm. A weighted base helps keep it stable, helping prevent it being knocked or blown over. 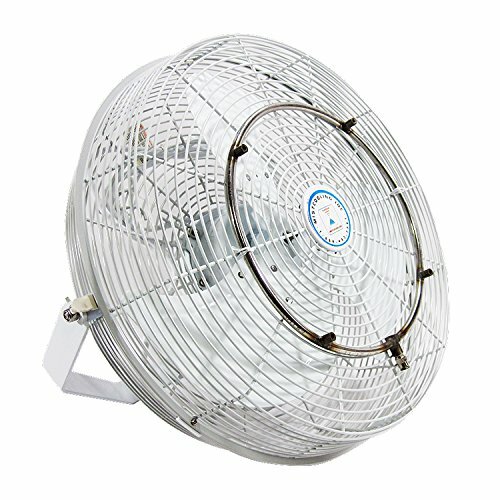 Regarding safety, this fan is ETL listed as safe for wet use to North American standards. It is also fitted with a circuit breaking plug. Height adjustable between 40-inches and 51-inches. Three speeds: 900 rpm, 1100 rpm, and 1280 rpm. Powerful fan and misting on the highest speed. ETL Listed for safety and circuit breaker plug. Can be noisy when in operation. This bronze finished fan will look good on any deck or patio. Even better, it will give you decent airflow, with the added benefit of the misting hose to keep you cool outside. Click on the link to check out the latest price. While entertaining or grilling outdoors, a fan in the backyard can be a great addition for any deck, to get the air circulating. Add to that a misting function which cools the air at the same time, and you’re all set to deal with the heat while searing your steaks. When the temperature cranks up, do you have a large patio which is a nightmare to cool? This fan has an airflow of 2475 cubic feet. Combine a misting function which can drop the temperature by 10 to 15 degrees, and you are onto a winner. Safety shouldn’t be an issue either. It’s ETL listed and has a built-in detection device, which will shut it off should there be a water leak. It’s also fitted with a GFCI plug to break the power if necessary. The manufacturer offers a limited warranty on this fan for one year. Standing 56 inches high, which is adjustable, and with a 19.38-inch diameter base, the attractive plain black fan will easily fit in where you need it. It also has contrasting 18-inch fan blades and both an oscillating and tilting function. This allows you to adjust the direction of mist and airflow conveniently. A standard 0.75-inch garden hose attaches to supply water for the misting function, which will cover up to 500 square feet. 38-inch diameter base and 56 inches high. 500 square feet air and misting coverage. Built-in cut off for water leaks. Quick and easy to assemble. Spray from the mist may not be fine enough—you can get wet if too close. Not recommended for indoor use. Fixing a fan in one position and forgetting about it can take away the hassle of having to set it up each time you need it. Furthermore, if you have pets or young children, it can keep little hands and paws safely out of reach. Here are our choices of the best wall-mounted misting fans. Maybe you have a small patio or deck and don’t want space taken up by a freestanding fan. Having a misting fan fixed to the wall could be the solution you’re looking for. It will give you a good air flow and keep you cool when the heat gets too much. Mistcooling brings us this high-velocity fan, which easily mounts to a wall. A bracket secures it in place and allows either horizontal or vertical movement, depending on how you choose to install it. The 18-inch blades are made from industrial grade aluminum, which makes them strong and durable. There are also three rotating speeds that can be swiftly changed at the pull of a chain. The finish of the fan is resistant to corrosion, and the sealed motor is rated for outdoor use. It also has a thermal protection overload built in, adding to the safety features. The misting function has four brass and stainless steel nozzles fitted onto a stainless steel misting ring. This gives a decent coverage of 6300 CFM—rapidly cooling your immediate vicinity. The misting system is compatible with both high and mid-pressure pumps, and can support between 160-1000 PSI. The greater the PSI, the more misting you will experience. You get 9 feet of electrical cable, which has a heavy duty cord wrap, giving you scope if power outlets are limited. It also meets the standards set for electric fans, sporting the UL507 certification. This misting fan is an all-rounder, suitable for home use, on patios or indoors, as well as commercial or industrial settings. Fan rotation up to 1570 RPM. Works with pumps from 160 psi to 1000 psi. Suitable for residential, commercial and industrial use. Large coverage area with three different speed settings. Rated for outdoor wet use. This fan provides a good airflow. However, you will need additional equipment set it up for misting. It’s durable and, being wall-mounted, frees up valuable floor space. Click on the link to check out the latest price. Mounting a fan on an outside wall might give rise to a few concerns. How long will it last and is it suitable for all weather conditions? Knowing that something is both durable and safety rated for outdoor use will give you peace of mind. If you want a sturdy fan for your outdoor location, this OSHA approved product could be a good choice. It’s UL507 certified for use in wet and damp conditions, with a commercial grade sealed fan and a thermally protected motor. It also has an epoxy resin coating which is resistant to corrosion. The 18-inch balanced fan blades are made from aluminum and can be used at three different speeds. It’s all controlled by a simple pull chain so you can have as much or as little air flow as you want, when you want. On the highest setting, maximum output reaches 6200 CFM. It has a wall mounting kit which is also suitable for wood. The fan pivots on the central anchor point so you can easily adjust it to the exact position right for you. Power is supplied from an 8-foot heavy duty cord with a GFCI three-prong plug. It can be modified to mist by purchasing a conversion kit. The company is confident that this fan is made to last, and offers a two-year limited warranty on materials and craftsmanship. Corrosion resistant finishes an all-metal construction. Industrial quality motor sealed for outdoor use. Option to convert to a misting fan. Weatherproof with good safety features. While a good option for a sturdy, industrial quality outdoor fan, the misting kit is an optional extra. That said, the airflow it puts out is pretty powerful on its own. Check out the latest price by clicking the link. If you need something on the go, a portable fan can give you many options for moving it wherever you want. This is our number one out of the best portable models around. 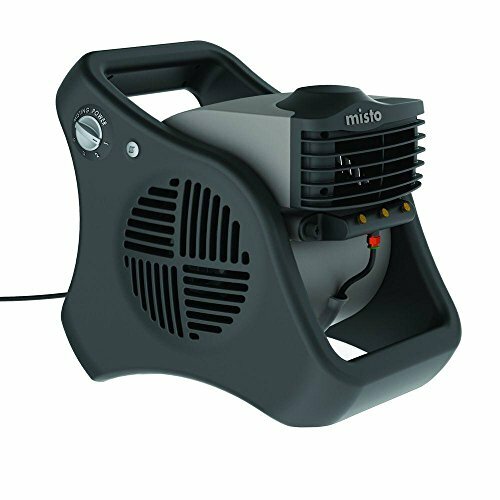 If you are looking for something lightweight and compact to move between your greenhouse and your patio, or the pool and the picnic area, the Misto outdoor fan could be a suitable option. With its slightly futuristic look, this compact outdoor fan is ideal to place on your deck or patio. Measuring 16.25 inches by 12.3 inches by 14.85 inches it certainly won’t take up much space. However, just because it’s compact, doesn’t mean it’s not powerful and efficient. The mighty blowers and three misting nozzles can reduce the air temperature around by up to 25 degrees. You can either direct the fan where you want it or pop it on the 90-degree pivot function for a wide sweep of an area. Purposely designed for outdoor use, it’s ETL listed, and resistant to weather, UV rays, and rust, ready to fend off the elements. Safety is also addressed, with a GFCI in-line power cord and a patented plug, cutting the power if an electrical hazard is detected. You don’t need to be a techie wizard to get this fan working. Just connect it to your regular garden hose, plug in and enjoy. You can also choose from three speeds of airflow controlled on the unit. Dimensions: 16.25 inches by 12.3 inches by 14.85 inches. Temperature reduction by up to 25 degrees Fahrenheit. Rustproof, weather and UV resistant. Built-in safety features for outdoor use. Standard garden hose attachment for water supply. You will get very wet if you sit too close. 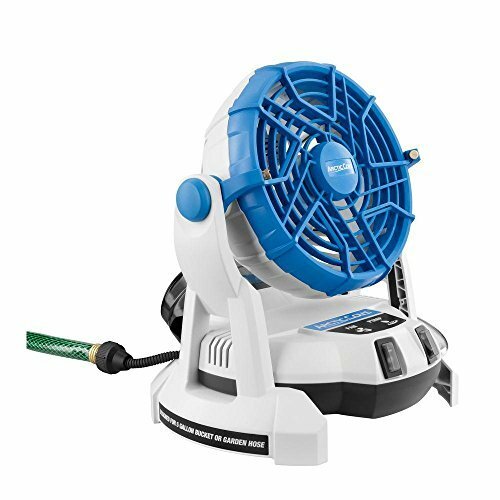 There are times when we don’t have an electrical power outlet nearby, so a battery-operated misting fan is an alternative option, and this model would be our first choice. Do you enjoy camping trips, vacations in the RV, sitting in the bleachers at little league, or a day at the park? In the height of summer, it can get very hot out in the elements. A fan you can take along with you will help bring down those scorching temperatures. Weighing only nine pounds, this battery operated model is extremely portable. It also has a dual purpose design – it can be used attached to a garden hose or situated on top of a standard five-gallon bucket (not included). When opting for a bucket it’s a simple process: all you do is fill it up, place the tube into the water and switch it on. The water is pumped up into the fan and diffused through the air, via two misting nozzles. If you have access to a garden hose, then simply attach it using the connector. You get an 18-volt lithium-ion battery and charger included. The battery will last for around 2.5 hours, which should be enough to catch a ball game or a picnic in the park. However, if you’re planning on a full day out, it’s conveniently compatible with other, longer lasting, batteries. Measuring 15 inches by 12 inches by 13 inches, the fan is compact. The pivoting head can be adjusted to direct air and mist where it’s needed, and there are high and low-speed options to manage the flow. The water spray may not be as fine as some other misting fans, but if you don’t mind a little moisture, it’s a great way to keep you cool away from home. Battery operated (battery and 6-hour charger included). High and low switch to adjust airflow and misting. Supplied with battery and charger. The pump can be quite loud. Water mist is not very fine. When you’re heading out for the day, the weekend, or on vacation, this fan could be one of the essentials to pack in your trunk. Its misting will keep you cool and fresh, instead of having to run for the shade. Check out the latest price by clicking the link. 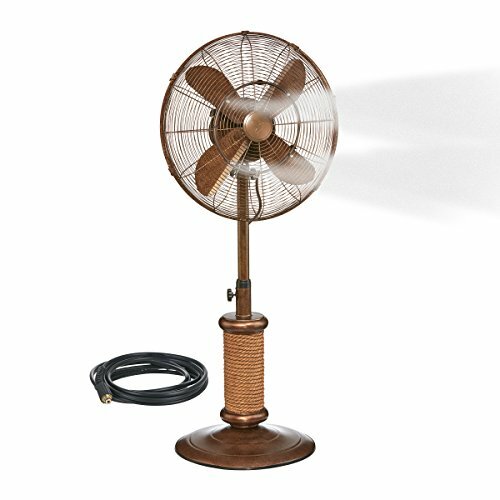 If you have a regular fan that works perfectly well, you might not want to spend more money on a dedicated misting fan. A kit to convert what you already have is a great, cost-cutting idea. 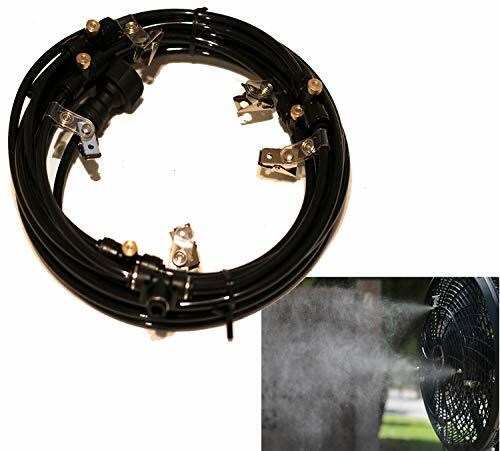 Here are our favorite conversion kits for creating a misting effect with a normal fan. Converting an existing standard fan to supply you with a cooling mist with this kit is a breeze. All you need is a water spigot and a little time. You will soon be enjoying your outdoor space while being refreshed by cooler circulating air. The great thing about this is you can convert most fans for misting with this attachment. It’s available in four sizes, to fit fans from eight inches up to 18 inches or bigger. The tubing is ¼-inch diameter and you are supplied with 20 feet leader tubing. There’s an adapter for connection to your existing water spigot. This also has dual EPDM rubber O rings, to prevent leaks. The tubing is NSF rated and made from linear, low-density polyethylene. It can accommodate 236 psi and is strong and durable. This means your misting ring should last many summers. The nozzles are either brass or nickel plated and have a stainless steel opening. Clips to secure the ring to your existing fan are also supplied. 8-inch, 2 nozzle ring for fans eight inches and upwards. 12-inch, 3 nozzle ring for fans 14 inches and upwards. 12-inch, 4 nozzle ring for fans 14 inches and upwards. 16-inch, 5 nozzle ring for fans 18 inches and upwards. Minimum 35 psi and maximum 100 psi. Easy to attach to your existing fan. Nozzles need regular cleaning to ensure they don’t clog. Can dispense too much water if the pressure isn’t right. This kit is an excellent alternative if you’re on a tight budget. It’s easy to fit onto your existing fan and comes in four sizes, so there’s sure to be one that suits. Check out the latest prices by clicking the link. Parties in the great outdoors at the height of summer can be a pretty hot affair. Even the strongest fan is just going to push the hot air around. Adding a misting kit to the mix could take it to a whole new level – a cool one! Your normal fan can be upgraded to supply a cool, refreshing breeze with this misting kit. Supplied with all the parts required, you just attach to your garden hose so it’s foolproof to install. The misting ring measures 10.5 inches in diameter, and the 9 feet 8 inches of hose gives you the freedom to place it wherever suits you. There is also a standard attachment to hook up to your water supply. It has four evenly distributed nozzles, which emit a fine spray to cool both you and the surrounding air. The clips ensure it fixes quickly and securely into place on your fan. The company offers a one-year limited warranty on this misting conversion kit. Hose measures 9 feet 8 inches. Comes ready assembled and is easy to fit. Mist can be a little wet if you are too near. This misting kit will go a long way to cooling your backyard. Simply place your fan, with the kit attached, in a position where you won’t get soaked, and enjoy the pleasant reaction of your guests. Click the link to check out the latest price. Being a prisoner to air conditioning during the hot summer months can become a thing of the past with the addition of a misting fan. This appliance can make outdoor life more comfortable so you can enjoy your garden, however hot the temperature gets. There are options available to suit all needs and budgets. Just decide which is the best outdoor misting fan for you, and then enjoy your deck, patio or pool area without the stifling heat. We hope you enjoyed our guide to the best outdoor misting fans and found our insights useful. Please leave us a comment with your thoughts or experiences. We will make sure we answer every comment or question. Best Gas Grills Under $500 – Great Quality, at an Affordable Price!